What more can I say? Snails in the classroom, one of my favorite things and now one of my classroom's favorite things. The Sunday morning before our week of snails, I armed myself with a plastic resealable bag and stepped out into the yard a few minutes after the sprinklers turned off. Snails like moisture and I had to get to them quickly before the mister did them in as they are ferocious eaters and chomp on most everything in the garden. Snails will keep in a container in your fridge for about a week. Add a leaf or two of lettuce or cabbage and seal it up and they are good to go. We kept misting bottles (to keep our mollusky friends comfortable) at the science table along with magnifying glasses and a small mirror. The children enjoyed watching the snails wake up from the refrigerated slumber and counting them throughout the day to see if they were all there (we had one adventurous fella who often strayed away). 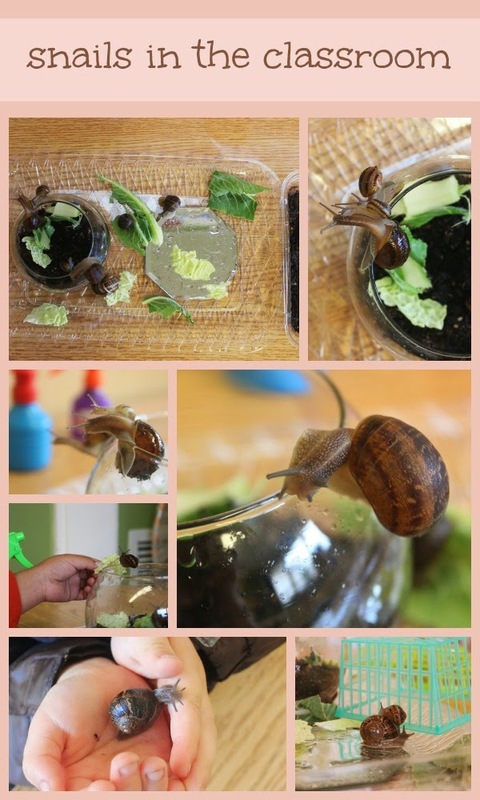 The children learned about the parts of the snail and habitats. At the end of the day, we returned the snails to their rinsed out bag and gently placed them back in the refrigerator. Don't forget to rinse out the bag so that the poor things will not have to wallow in their own poop. Also, snail poop is hysterical to children. Hysterical! We kept our friends for a week and liberated them to our play yard in the canopy of our enormous succulents. Your blog makes me wish I still taught preschool! One year we filled the sensory table with dirt and added night crawlers. Those worms were loved to death, literally. Wish we had thought of snails. I love reading about the experiences you set up and how the children sometimes run in another direction. Isn't that what it's all about? Thank you, Jill! We have a compost pile at home and next year I am sooooo bringing in the worms! mini fourth of july round-up!